Last edited by Tisha on Sat Sep 26, 2009 8:07 pm, edited 12 times in total. I absolutely love the map, but I'm not too sure what the point of all the northern territories are? Everything else seems to be segregated by a group of Native tribes. Up North you started using names of the territories? It just seems like you started putting in territories for the sake of territories and lost the "theme" of the map. Personally, I'd just take out each of the arctic territories and it still works great. But like I said, it's beautiful. Bones2484 wrote: I absolutely love the map, but I'm not too sure what the point of all the northern territories are? Everything else seems to be segregated by a group of Native tribes. Up North you started using names of the territories? The graphics are spectacular, little work needs to be done there. 1. Make the river define territory boundaries as you did up north in Alaska. 2. Scrap the rivers entirely since there are only 3 on the map and they are not impassable. That should should clear up the problem. Make the "hopi" territory larger, extend it down south. Combine NezPerre and Flatfoot into one territory and make it part of the Great Basin Bonus. Add a # to the Plains and South East Bonus. The Mountains look FANTASTIC! and the background is just... my jaw actually dropped when I saw this map. I vote for keeping the northern Territories, the map would look much worse as being just half of North America. This map looks gorgeous.. the mountains look like they were done individually. It'll get quenched, probably with no graphic adjustments. Agreed. 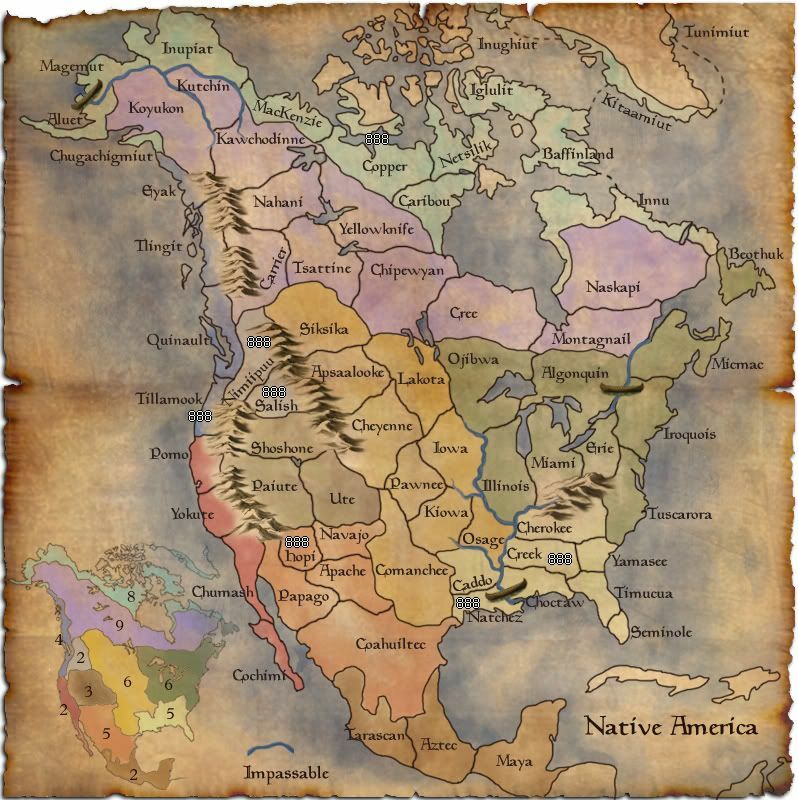 The map could probably use more impassables anyways... maybe the Ohio, Missouri, and Mississippi rivers. Of course, that is silly based on the theme... I dunno, but these rivers were very important, so somehow making them more prominent can't hurt. The Meso America and Plateau bonus seem pretty easy to get compared to the others, don't they? And you have more bonuses than regions, which I'm sure that you noticed. Beothruk(Northeast Woodlands) is connected to Labrador? I assume East and West Greenland connect? Do you use the territory names instead of group names because the group is the same over all northern territories? I agree and disagree with some of the artic comments - there were native indian tribes living in these parts of the world - the Inuit tribes... I suggest perhaps finding tweaking a couple of those names for these to hit the theme deadon. 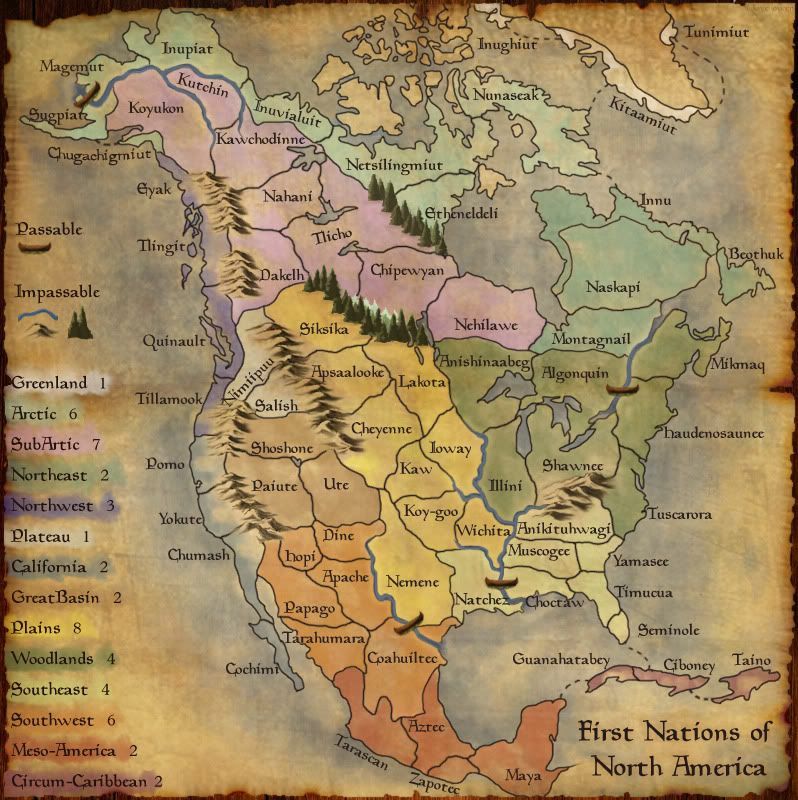 yeti_c wrote: I agree and disagree with some of the artic comments - there were native indian tribes living in these parts of the world - the Inuit tribes... I suggest perhaps finding tweaking a couple of those names for these to hit the theme deadon. If this can be done, then it would be a much better solution than taking them out completely. Once I'd picked my jaw off the desk, I had a quick glance over the gameplay... My first question relates to the rivers... are they intended to be impassable? I'm inclined to think they aren't, in which case they could be made more subtle. The rivers in the centre of the map (Illinois area) seem to clutter that area a bit too much for my liking - that's the difficult thing about rivers that don't follow territory borders! The Arctic region is a little confusig, as there are some bits of islands that have colour, but no name. While I appreciate that some territories span the water, this area is a little confusing. There are no paths/connections over the water, which makes the Arctic look a bit disjointed. That isn't a problem, but would probably warrant a higher bonus? My final comment is that the map doesn't feel that balanced... there are a couple of small easy areas to get and hold early on, while the rest of the areas feel vast and hard to get in comparison - If you are able to get a +1 or +2 early on, I'd imagine that you'd be half-way to winning already - the SouthWest feels like a much more attractive place to start than anywhere else. Tisha leaves for a year or 2, then returns with this?! You've been practicing I see. First of all, you've got to tell my how you did those mountains. Did you really draw/shade them by hand?? The colors are great. Very faded, but still able to tell regions apart (except for the north/western us). I would suggest making the Mississippi into a border also, and not drawing a border on top of it. But at first glance, you've got a fantastic first draft - well done! 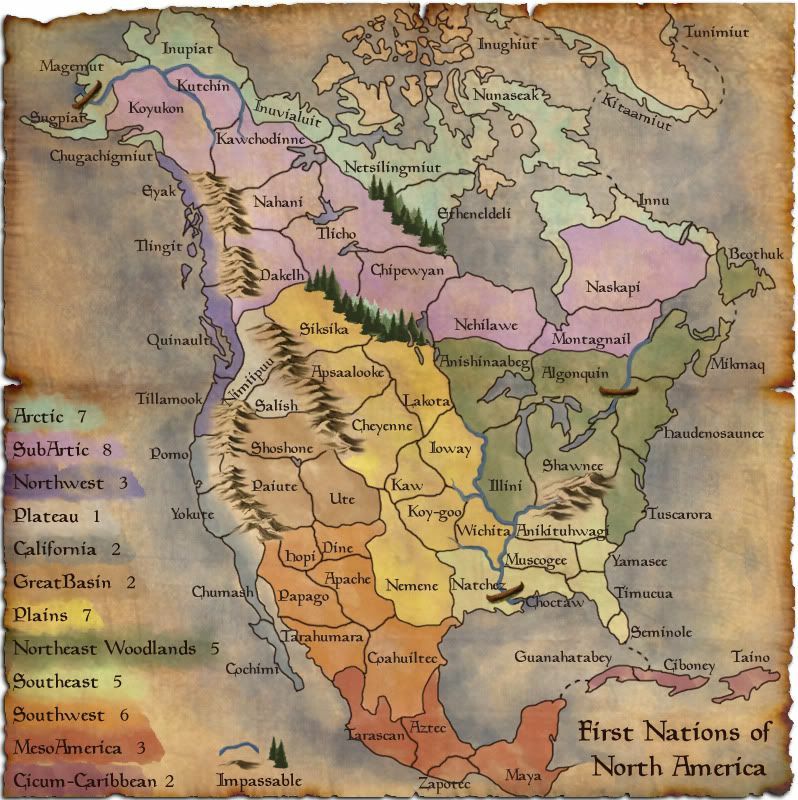 i like the idea of that, looking foward to play it, but the names of the northen regions are not right : Mckenzie was named later, alaska, cooper etc ... those were not named back in 1500, at least not with theses names, but like i said the map is great !!!! The map looks great, but if you're aiming for accuracy, it's going to be hard, especially for the year 1500. Many of the names you gave Indian groups were given by Europeans when they encountered and/or learned about them, which happened much later than 1500. 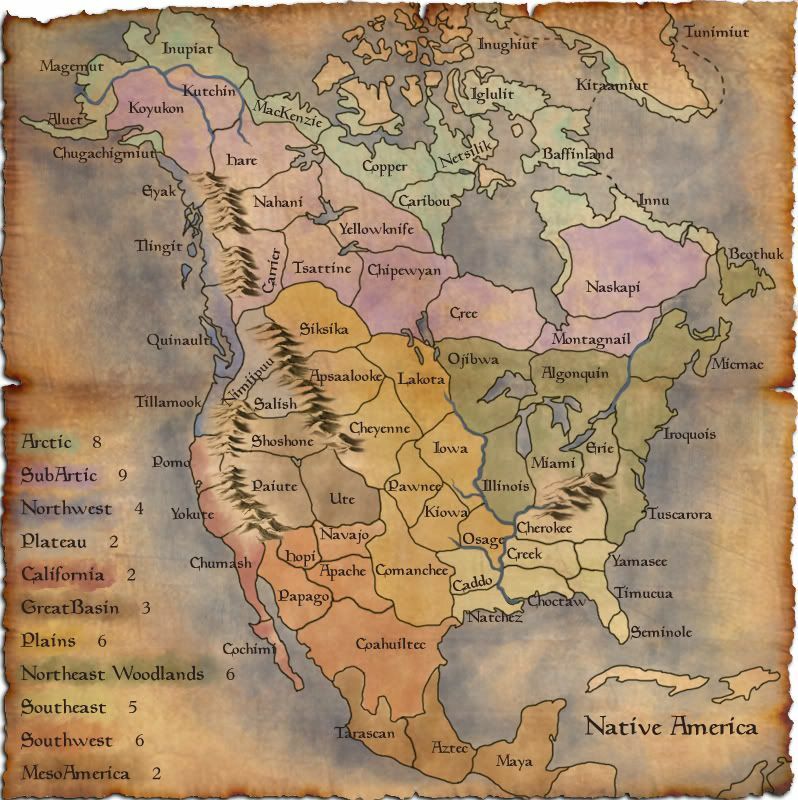 Names like "Crow" "Blackfeet" "Nez Perce" and "Pawnee" that don't have their origins in a native language reflect this. I don't know how to resolve this, but it's just an observation. I guess my point is it seems like you're trying to depict the continent before the sustained impact of white people, empires, and modern nations, and so the name thing might get in the way. It might not be important to you however. Some of the groups in 1500 didn't occupy the areas where you have them. The Comanche are a Shoshone-related group that immigrated to the southern plains in the 1700s to take advantage of the buffalo economy. The Choctaws weren't really an entity until after 1500, and the Seminoles weren't around until well into the 18th century. These are only a few examples. It might take a little research. Long-ranging sea routes will be hard, REAL hard for 1500. By the way, I think you mean the "Flatheads" and not the "Flatfeet." They weren't infamous for being a clumsy, awkwardly-moving people. Last edited by ghirrindin on Mon Mar 09, 2009 6:51 pm, edited 2 times in total. When did the spanish go to America? Well Tisha I will save my comments as you know what I think already. With that said, I cannot wait to see this in action! Tisha! Your skills have evolved a whole bunch since the last time you wandered the halls of the foundry. You have definetly created a really nice parchment feel to this map! I will definetly be keeping an eye on your progress through the foundry this time round! 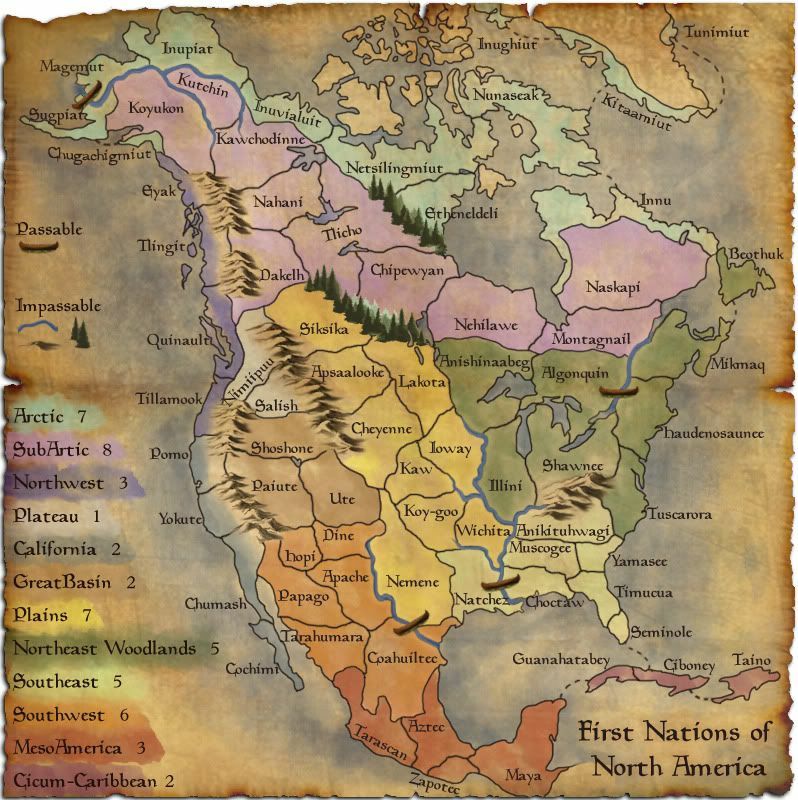 Tisha wrote: just wanna put this out there..
East of the mississippi there were confederations of tribes. 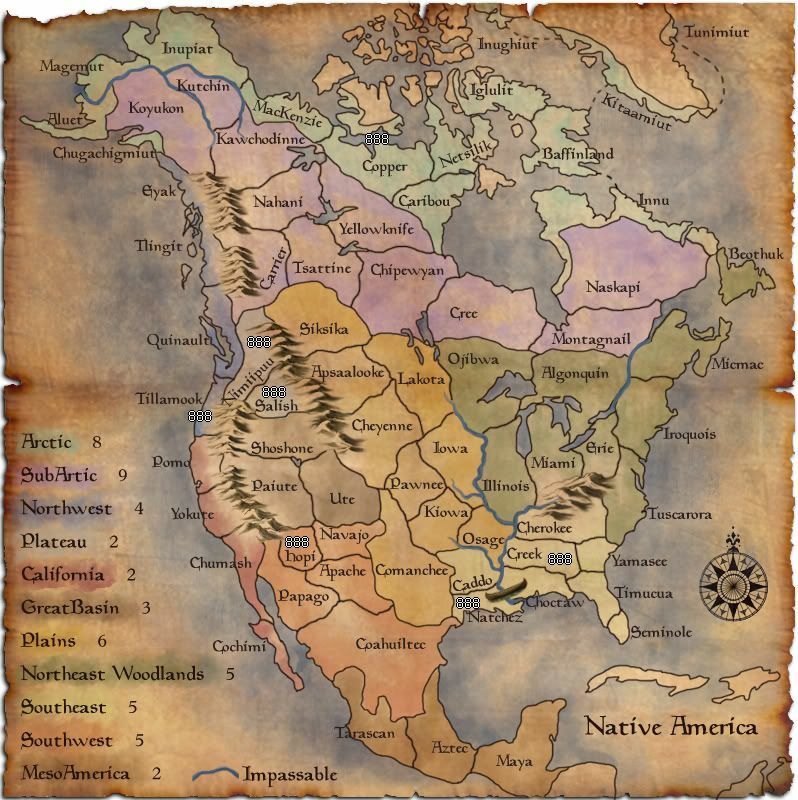 You should use the confederate names on account of the many various tribes that made up the differernt nations there. 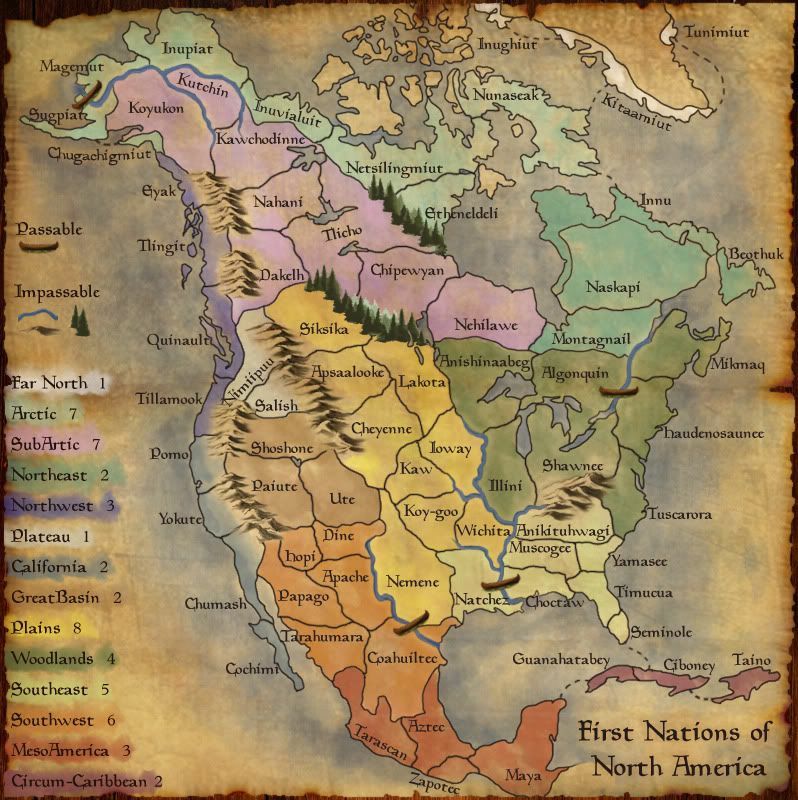 I believe that the Seminoles were one of the few tribe not involved in any federation but most east coast tribes were involved in one. I'm just glad you recognized my tribe, Nez Perce. -I'm still working on names of territories, and probably will be for quite a while.. any information there helps..
-I added some sea routes. 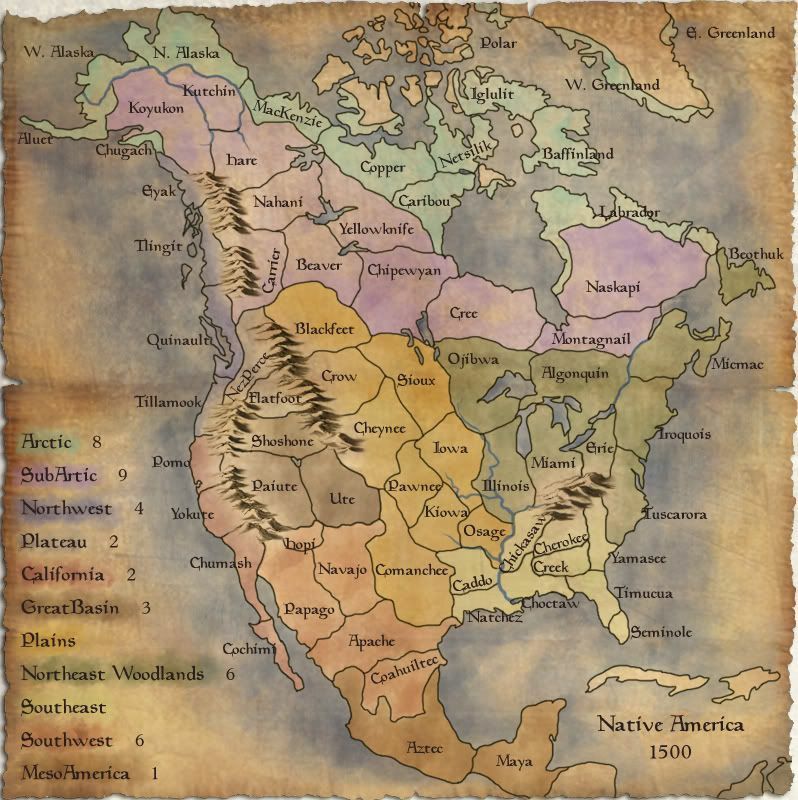 -I took a territory out of the east of the Mississippi, and added one to MesoAmerica. -I darkened a couple of the lands to make them easier to tell apart. -I would like the rivers to be not passable, so I made them more noticeable. I also changed the flow of one of the rivers so i could use it as a border. i'll repeat what date did spanish go to america? 1.What does the territory on Victoria Island belong to? Is it a separate territory itself? 2.What does the territory on Southampton Island belong to? Is it a separate territory itself? I don't think Newfoundland should touch Labrador on the map. A sea route to connect them might be better. miniwally wrote: i'll repeat what date did spanish go to america? kind of a strange question for this thread.